In this cottage, a simple oval table is surrounded by a tufted sofa, a pair of English club chairs, and a couple of cushioned side chairs. The worn black finish on the distressed wood dining table contrasts with the elegant floral fabric covering the sofa and club chairs, adding depth to the room. At this lake house, a minimalist white Parsons table keeps all eyes on the amazing scenery beyond the windowed wall. The open backs on the Chinese Chippendale chairs make a statement but don’t block the natural splendor. 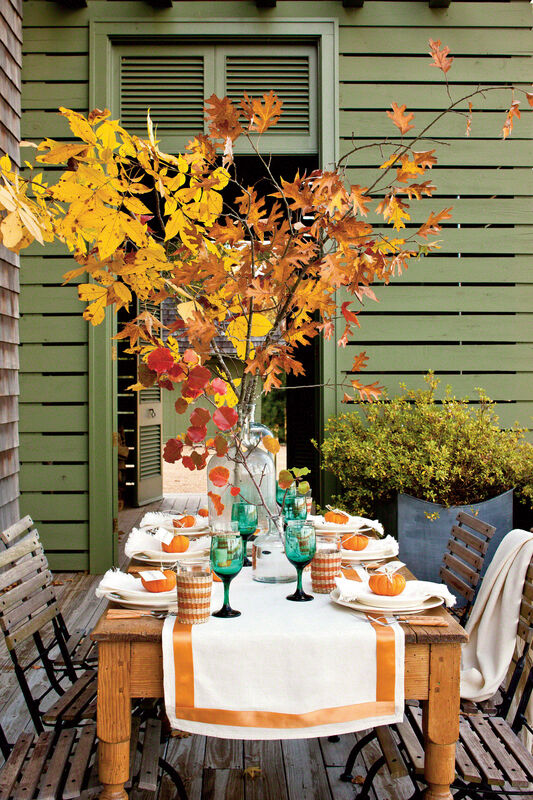 Nothing sets you at ease like a down-home farmhouse table. Turned legs offer a little extra flair, and drawers for storage on either side mean no need to traipse back to the kitchen to replace a dropped fork or napkin. To make the most of a small dining area, consider pairing a compact bistro table and a built-in banquette. This L-shaped version offers abundant storage underneath and a comfortable cushion on top. Because this table is lightweight, it can be moved easily to access the drawers. This eye-catching table has a unique base made from a naturally bleached cypress tree stump and a top made from waxed zinc. Upholstered in a bold brown buffalo check, the chairs are accented with nail-head trim for a more finished look. The essence of elegance, this oval-shaped table with inlaid-wood detailing on the top boasts gold accents on the legs. The golden tones are carried through the room with nail-head trim on the black chairs and even on the wallpaper. The dining room of the historic Ernest Hemmingway home in Key West, Florida proves that formal doesn't have to be fussy. 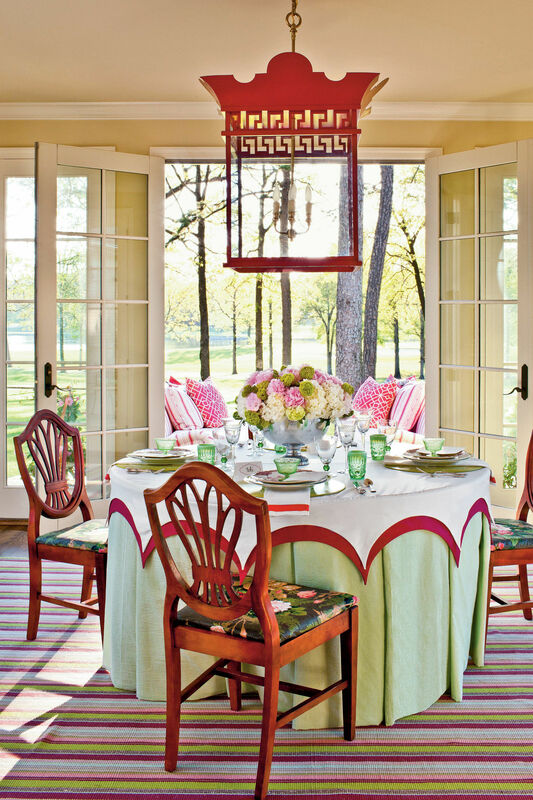 In this case, the dark wood of the traditional pedestal table is set off by bright tropical colors. Coral-upholstered chairs surround the table, turquoise draperies frame the window, and a showstopping chandelier adds sparkle. A handsome trestle table enhances the rustic elegance of the dining room in this cabin-inspired lake house. With the long banquette and plenty of upholstered chairs, there’s room enough to host a crowd, but it still feels cozy enough for a quiet meal for two. In this home, the central hallway also serves as the dining room, so space saving was a big consideration. This drop-leaf oak table can be expanded for serving dinner or left down when not in use to facilitate traffic flow through the house. Skirted Parsons chairs can be moved to other areas of the house to provide extra seating. This table’s soft oval shape, distinctive base, and light finish are even more striking when juxtaposed with the dark upholstery and sharp angles of the 14½-foot-long banquette. Three other seating styles offer variety to the room, while an enormous chandelier with iron detailing draws the eye up. A Saarinen-inspired table adds mid-century drama to this sunny dining nook. The bold coral fabric gives a jolt of energy to the classic camelback sofa, and a zigzag print livens up the upholstered chairs. A graceful oval table is crafted to showcase the inherent beauty of the wood grain. Surrounded by locally made Windsor chairs, it seems right at home in this 1856 cabin. This claw-foot pedestal table fits well in a small dining area and can be expanded with leaves when hosting guests. Compact, armless side chairs take up less space and reflect the curves of the round table. Casters at the foot of the table enable it to be moved easily.